I was sitting at home on a Tuesday evening....bored out of my mind I began checking out my Pinterest page. I suddenly came across a collage of Spanish/Flamenco inspired dresses. I was so inspired! I wanted to make a quick sketch of a dress with that feeling, but in a modern wearable version. 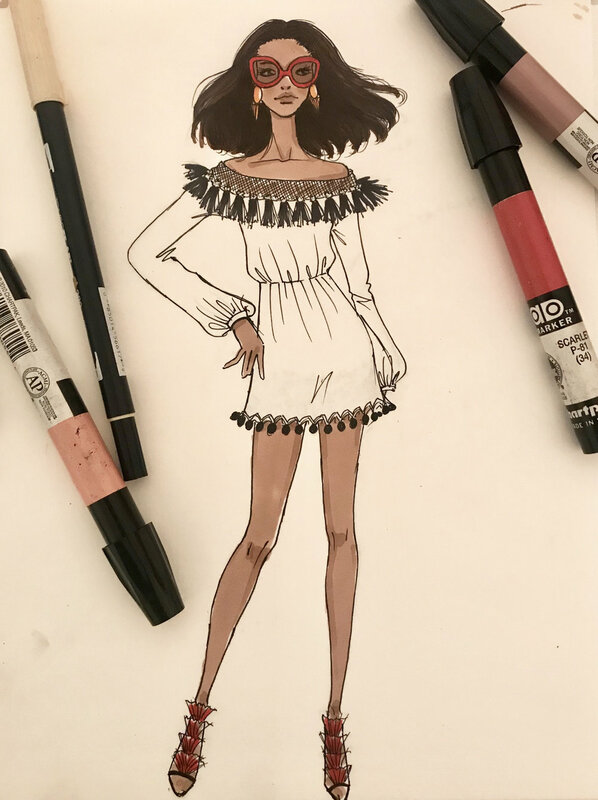 So then I decided to clear my drawing table of all my makeup and hair products (I'm such a mess at home) and start sketching this dress, inspired by the Pinterest images I saw. Chart Pak Markers - For darker skin, I love using Suntan! For the shoulder section of this dress, I wanted the fabric to be made of a stretch mesh. The entire dress is made of lace and the hem is a pom-pom fringe. When I draw, I start from a pencil sketch and then render as much as I can before I move on to the Micron Pen. I usually like to use a light box when I'm working on paper like this. I trace over my rough sketches and renderings, adding more details as I go. But of course, I'm super cheap and decided to use another method to trace over my renderings. Funny enough, I used my iPhone flashlight on top of a large plastic cup and it worked pretty good as light box! so if anyone needs a lightbox and is not ready to fork out the cash for one, try this method! haha! Once I got the sketch worked out I started inking my sketch and starting thinking about skin tone and the ethnicity of my model in my sketch. For the skin tone, I decided to go with a dark tan color. I just thought of a darker skinned cuban woman for some reason. So, I went with that skin tone. Melanin is a beautiful thing! Especially when I add it my sketches! When rendering lace and fringe I don't ever aim to sketch perfectly. 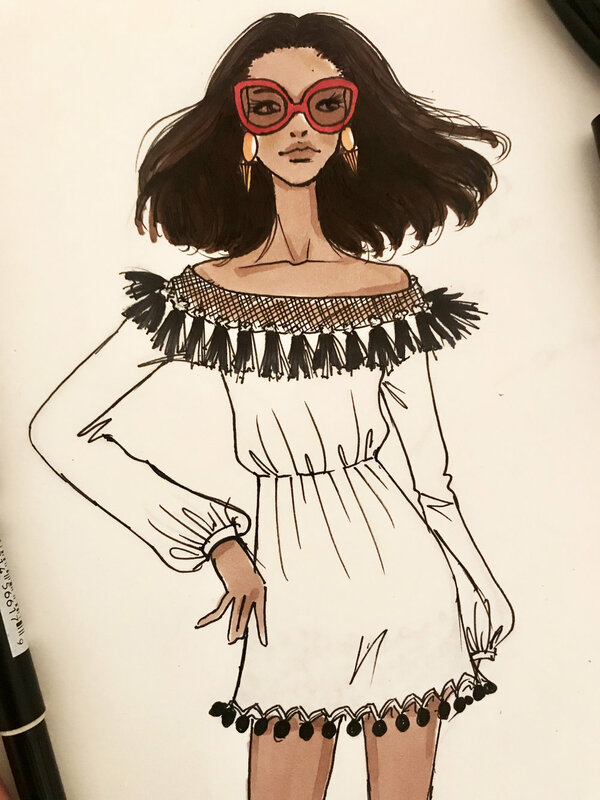 When sketching fashion, the art is inventing the illusion of that fabric, not stressing about having the perfect looking fabric in the right color and texture. The art should give that feeling. I sketch my lace and fringe very freely. You get the point from looking at the sketch. I decided to go with a red outfit. I just love seeing red on a Latina woman! Next, after all the colors are worked out in my sketch, I uploaded it to my computer into Adobe Photoshop. I wanted to use this sketch on my website and store it on my computer - I usually upload it there. I use photoshop to adjust the brightness and the contrast. I also use it to add some color to the skin, makeup and prints/patterns on my sketches. It's the best way to finalize it for the web, Instagram or editorials. Check out my latest sketches section of this site to see the final sketch of this dress! Comment below if you have any questions/suggestions. Let me know if you want to see a video demonstration of how I created this! Thanks for reading! as always!